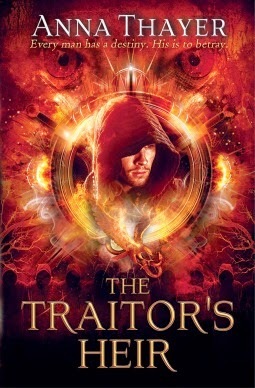 The Traitor's Heir by Anna Thayer is available from Amazon, Barnes and Noble, and BooksAMillion. In an epic and mystical tale that resonates with modern times, the young Eamon Goodman goes on a journey of discovery. A journey which sees him taking an increasingly pivotal role in the battle between the rival forces of the king and the master, and takes him from being a young soldier in his home of Edesfield to being a fast-rising hero in the dense and rotten city of Dunthruik. Under the watchful eye of Lord Cathair, in the loving arms of Lady Alessia Turnholt, and torn between enemy forces, Eamon’s experiences lead him to question the nature and true meaning of some of the most important things in life - love and friendship, loyalty and honour, and who he really is. But will the answers he finds lead him to become true to himself and true to his name? Will they lead him to become a good man? I received a free copy of this book from LibraryThing in exchange for a review. This book was published by Kregel Publications, a Christian publisher, and if I hadn't known that, I wouldn't have read any Christianity into this story. The issues (greed/power) confronted here are also seen among other religions and are popular themes in fantasy worlds. The religion is there, if you look for it, but a lot of people could read this book and not see religion, just as they do with Narnia and Middle-earth. The Master is an obvious villain but I saw more parallels between the Master and the early Christian church than I saw between the Master and Satanism which led me to interpret this as a Christianity-being-destroyed-from-within sort of thing. Jesus versus the Jewish temple. Traditional ritualized Christianity versus progressive Christianity. I enjoyed looking at the story that way. My main issue was the writing - another round with an editor and this book would be solid. A couple passages fell flat with repetitive word choices. I was confuddled a couple times by events I wanted to tag as mistakes. I backtracked a coupled of times, thinking I had missed something but couldn't find the transitions and then, it turned out to be the writing device showing the extent of the Master's control. In the end, those moments did have meaning but I wish the execution hadn't pulled me out of the story's progression. I'm not sure how I feel about reading the second book yet. I may come back to it, if time and money permits but I'm not going to rush. I'm interested in seeing where this world goes but I'll wait for the second book to hit the sales racks.